Most authentic cultural experiences are born of young men lusting to share memories of home with a new audience, from Adolphus Busch introducing Bavarian lager to America, to Bavarian Franz Beckenbauer introducing America to the glee of saying "Franz Beckenbauer". 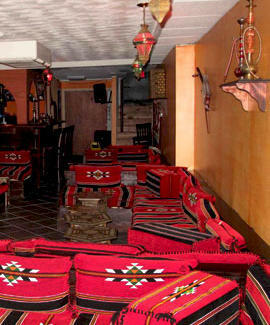 Introducing authentic hookah to Allston, Habibi's Lounge. Opened by a Lebanese BU student yearning to credibly replicate the social experiences of his homeland, Habibi's is a 50 seat "authentic Middle Eastern Hookah lounge" featuring low red Syrian-style cushioned couches, handmade mosaic tables, and tapestry draped windows in a small basement-level space, which was the third best basement renovation idea you gave your parents, behind a game room like at the Jacobs', or a sketchy place where everyone hooks up, like at that kid's whose parents are divorced. Once you've secured a hookah, you can choose from two types of tobacco; Arab Emirates-imported Al-Fakher in simple flavors of fruit (apricot, berry, coconut), spice (cinnamon, mint) and, um, golden (golden apple, golden grape... golden rose); or American "Starbuzz" in nine edgily confusing flavors like Blue Mist, Irish Cream, and X on the Beach, which is fun at first, but then you just get so damn thirsty! Foodwise, they've got snacks served with toasted pita, like homemade hummus, baba ghanouj, and stuffed grape leaves, along with smaller sides like carrots in lemon juice and an "olive and pickle sampler", introducing that snake-eating-his-own-tail situation where the person eating the dish becomes it. If you prefer sweets and drinks, they've got Baklavah and candied dates for dessert, as well as a selection of Moroccan teas, iced rose drinks, and fruit nectars. A liquor license is in the works too, but for the time being, you'll have to stick to introducing your own cultural experience of being loud and annoying to the dude making your sandwich at Redbones.